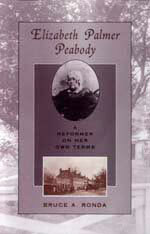 This is the first full-length biography of Elizabeth Palmer Peabody, one of the three notable Peabody sisters of Salem, Massachusetts, and sister-in-law of Nathaniel Hawthorne and Horace Mann. In elegant prose it traces the intricate private life and extraordinary career of one of nineteenth-century America’s most important Transcendental writers and educational reformers. Yet Peabody has also been one of the most scandalously neglected and caricatured female intellectuals in American history. Bruce Ronda has recaptured Peabody from anecdotal history and even blue-stocking portrayals in film—most recently by Jessica Tandy in Henry James’s The Bostonians. Peabody was a reformer devoted to education in the broadest, and yet most practical, senses. She saw the classroom as mediating between the needs of the individual and the claims of society. She taught in her own private schools and was an assistant in Bronson Alcott’s Temple School. In her contacts with Ralph Waldo Emerson’s Transcendental circle in the 1830s, and as publisher of the famous Dial and other imprints, she took a mediating position once more, claiming the need for historical knowledge to balance the movement’s stress on individual intuition. She championed antislavery, European liberal revolutions, Spiritualism, and, in her last years, the Paiute Indians. She was, as Theodore Parker described her, the Boswell of her age.